His mom was great. She was from Venezuela, and she was always making treats for us. I still remember the creaminess of the hot chocolate she made with melted Venezuelan chocolate bars. What I miss most are the arepas. Arepas are similar to hot water cornbread, but you use cooked corn flour, or masa harina. I’ve only made them twice in my life. They paled in comparison to the perfectly cooked corn discs of my youth. Nonetheless, they are tasty and I think with enough practice, I can make these as light and fluffy as I remember. Here is an excellent arepa recipe. I added garlic powder to mine. I especially like this recipe because there are many descriptive pictures to help you make your own arepas. I also decided to get a little creative with the chicken salad. Cooking the chicken was no sweat. All that’s needed are two boneless-skinless chicken breasts, salt, and pepper. Add the chicken to a small pot and cover with water. Add salt and pepper to taste. If I had chicken broth I would have used it instead of water. Then you cook the chicken in the boiling water until it is just done. Remove chicken and allow to cool. Once cooked, shred chicken by hand. The “salad” portion of this is essentially a remoulade sauce I came across. The original recipe came from serious eats. I added minced sundried tomatoes in olive oil. I almost forgot about the star of the sandwich…bacon. I used thick cut bacon and sliced the strips into thirds before frying. Assembly is the best part. Slice arepas in half. Apply chicken salad. 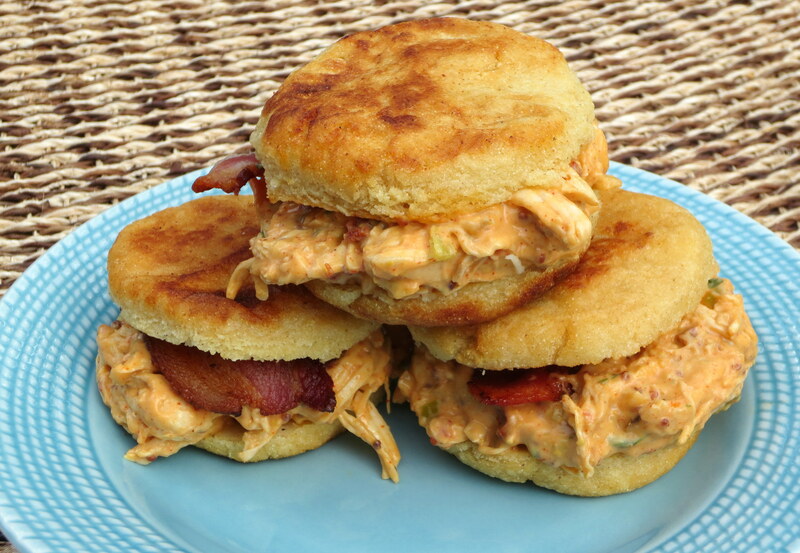 Top with a piece of bacon and add the top part of the arepa. It’s pretty straightforward. And delicious. I’m known for making sandwich monstrosities at home. I’m not saying that my sandwiches are abominations that should never see the light of day, I’m simply addressing the size of the sandwich. There was my quintuple-decker SPAM sandwich, the big four-patty cheeseburger, I even made a burrito that could only be eaten on a cookie sheet. It was probably eighteen inches with a 3 1/2 inch diameter. There is an easy way to make a meatloaf sandwich better. You have to make it bigger! I didn’t measure this ciabatta roll, but I was able to fit half a meatloaf on it. Sadly, this was an incarnation I could not complete on my own. I was only able to consume 1/4 of it at the time. I had plenty to share and I still had a midnight snack with it. This monstrosity could feed a small army. 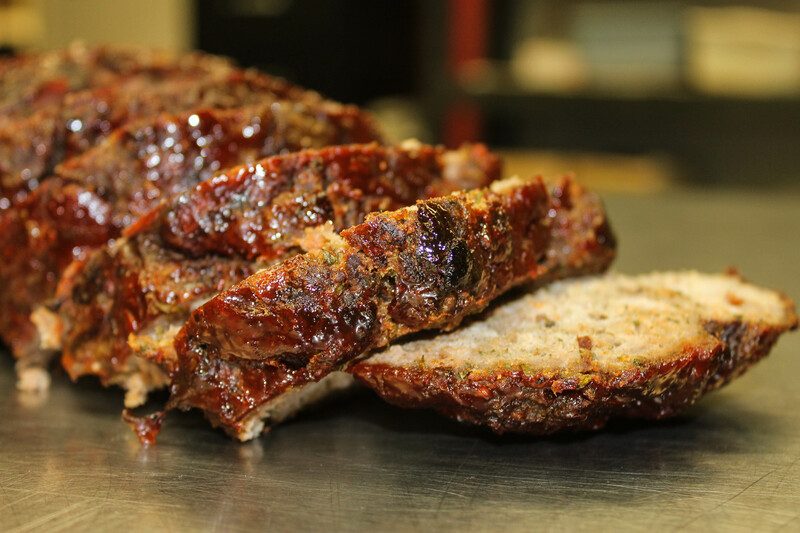 Sear meatloaf slices and place on bread. Place sandwich under broiler about a minute to melt cheese. 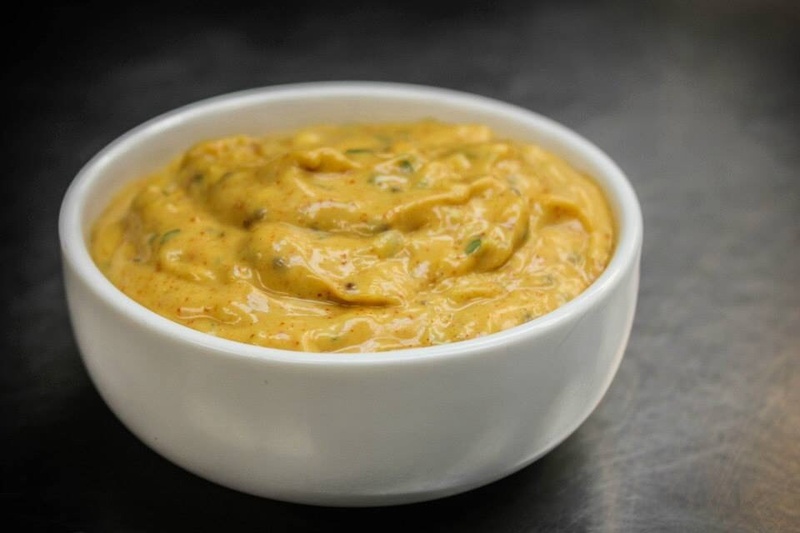 Add remoulade sauce directly to the sandwich, or keep separate for dipping and sharing. Slice sandwich into manageable chunks. Top Your Meatloaf With This! My mom always topped meatloaf with ketchup. When I grew up I moved on to chili sauce, but recently I have experimented with my own sauce. I know this sauce looks involved, but you really just need to dump and simmer. Simple. I have a feeling that this will make an excellent BBQ sauce. I’m going to test it out. Combine all ingredients and simmer until reduced. This may look like a lot of work, but the sweet tanginess with a touch of spice makes a great sauce for meatloaf. All photos courtesy of Stacy Crumpley. Or you can be lazy and reach for the ketchup. At least use balsamic ketchup. 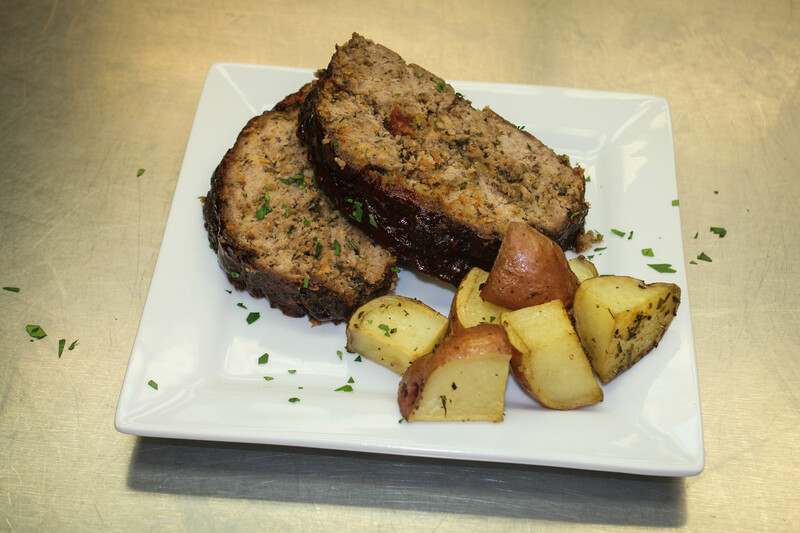 (If you really feel adventurous, enjoy your meatloaf with remoulade sauce). 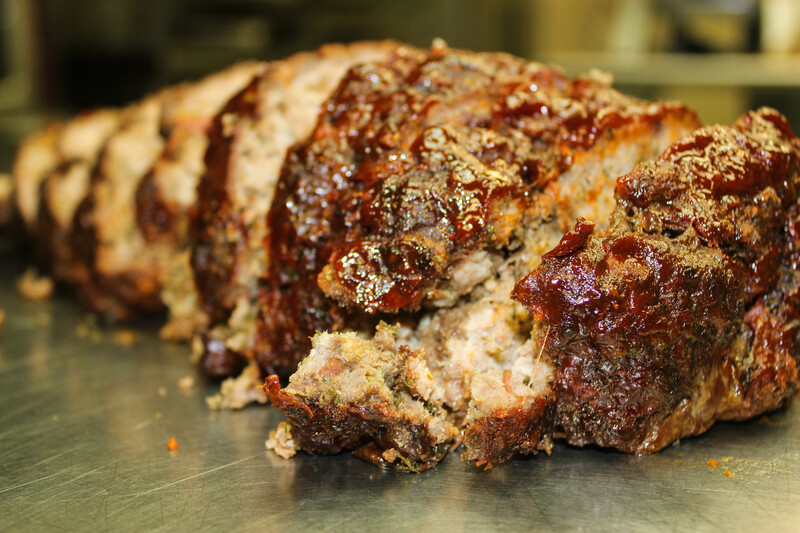 One of the preeminent comfort foods is meatloaf. It appears to be one of those dishes that is publicly jeered at, but secretly is coveted. I have eaten meatloaf from many places. There certainly is awesome meatloaf and there is meatloaf that is only suitable for Gallagher’s Sledge-O-Matic. It’s still meatloaf and I hungrily shovel it in. 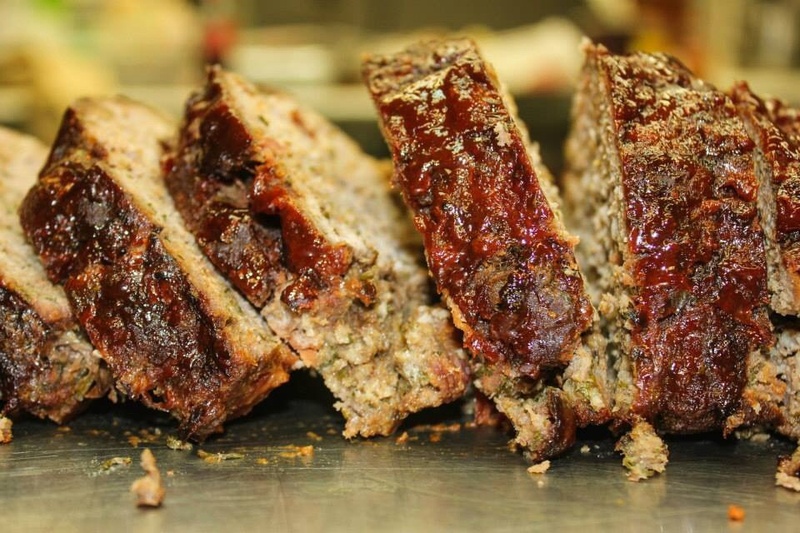 This particular meatloaf is an amalgamation of my experiences in trying different recipes, but it leans heavily on the freeform method that is typically in a mobile kitchen with Mercy Chefs. I just happened to write down the process today. I look forward to your critique as I’d like to know where on the spectrum it belongs. Maybe Gallagher and I need to eat smashed meatloaf. 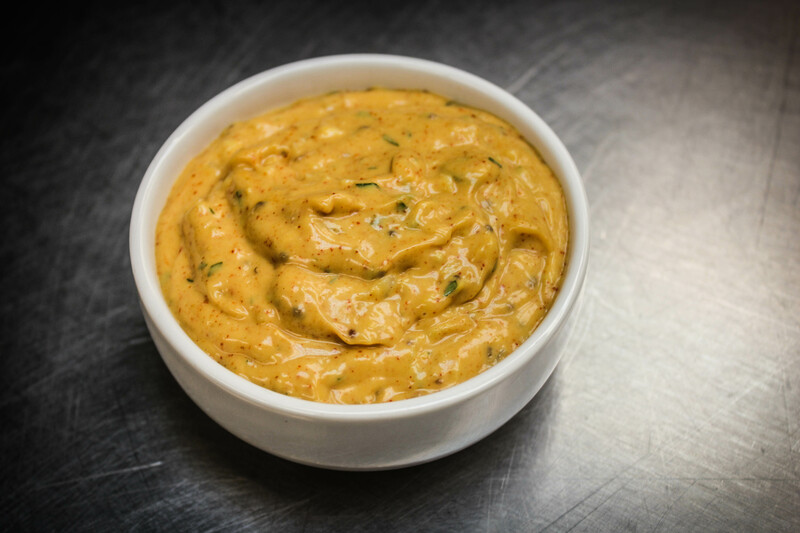 If you really want to enhance your experience, try serving with fresh remoulade sauce. Mix ingredients thoroughly, but do not over mix as it will make the meatloaf really dense. Form into loaf on cookie sheet lined with parchment paper. Coat meatloaf with homemade sauce (or ketchup). Cook for 75 minutes or until internal temperature is 150 degrees. Remove from oven and let rest. Internal temperature should rise to 160 at rest. Images courtesy of Stacy Crumpley. Photos courtesy of Stacy Crumpley. I’m a big fan of remoulade sauce. It seems that you have a good chance of getting remoulade accompanying anything that is labeled as ‘cajun’ in a restaurant. 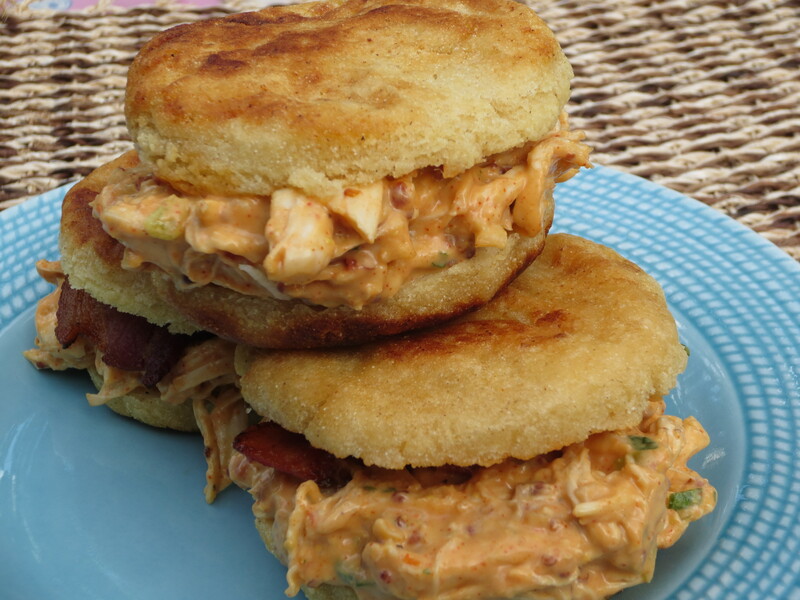 Have you ever had fried alligator with a nice remoulade? No? Then you haven’t lived. I made this specifically to make a meatloaf sandwich. It was delicious. This recipe is adapted from Serious Eats. I followed the recipe pretty closely (which is rare), and I was pleased with the results. It tasted nothing like remoulade I’ve ever had, and it had a nice bite. I just wish I had horseradish to really punch it up. Combine ingredients and let rest in the refrigerator for an hour so the flavors can blend. They bring a small bowl of these guys to you as you look over the menu. Since Dave Ramsey took over our home two and a half years ago, we haven’t had many opportunities to go enjoy a meal. 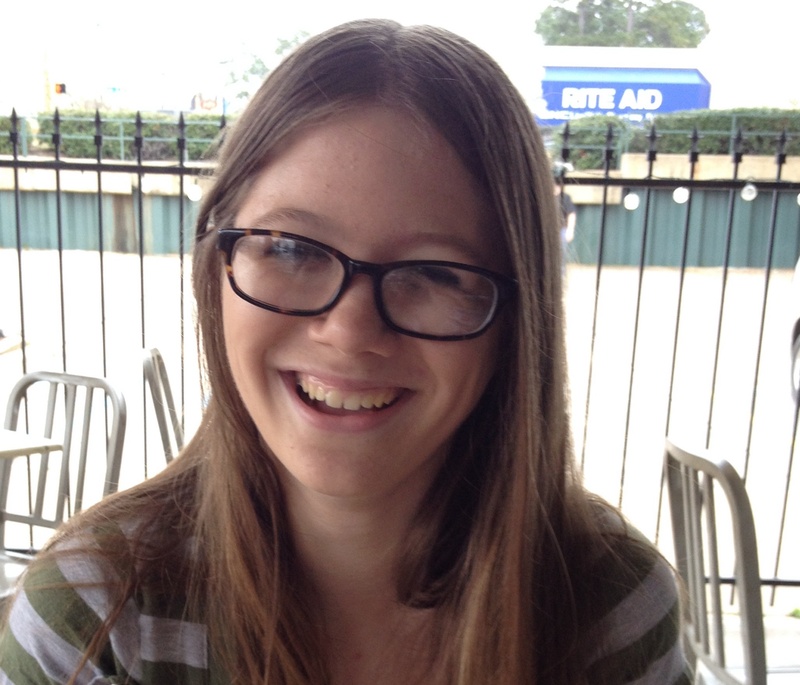 Today was different because I was only with my fourteen year old daughter, Alli, so it wasn’t too hard on my pocketbook. I try to frequent local places because franchises sometimes seem really stale, unless of course you are talking about Five Guys. I just love those fries. This afternoon was no exception and we decided to visit The Real Pickle. It’s been here as long as I can remember. I’ve only been here a couple of times prior, but those gastronomic experiences were definitely memorable. 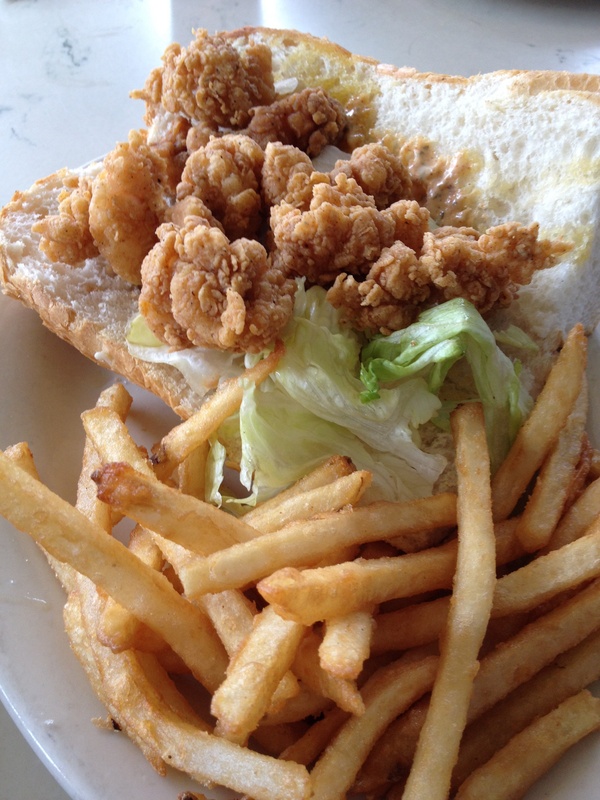 I usually get the shrimp poboy with remoulade sauce because it has always been excellent. Today, it was very good but it was too salty for my taste. We were the first customers of the day. Maybe the chef got too excited and oversalted the shrimp. Maybe I cut him off in traffic one day and he finally had his chance to get back at me. Nonetheless, I go light on the salt in my own cooking and I frequently have had meals at restaurants that were too salty for me. Perhaps I’m just a salt wuss. These fries are nothing like Five Guys. On the plus side, the prawns were breaded nice and happy and were a fried jubilee. The spice level was excellent. I love firey hot food, and typically if I can detect ANY heat, it’s too much for many people I know, but I was surprised with a nice, warm burn. The remoulade was remoulade. I don’t care where you get it. Remoulade tastes great. It tastes good on everything. The bread was so light and crusty and had a hint of buttery delight. The fries? Well, they weren’t Five Guys. Alli had a ham and something on a croissant. It wasn’t mine, so I didn’t pay much attention to it. She liked it and that is what’s important. Alli really enjoyed her ham and something sandwich. In fine, (I’ve always wanted the opportunity to say “in fine” as I remember it from the poem “Richard Cory“). In fine, the most important aspect was that I had an opportunity to spend some quality time with Alli. I need to take her to another Texas BBQ joint soon, but that’s another story.